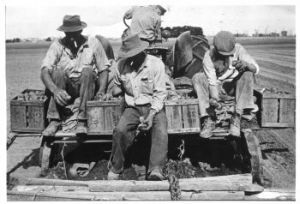 The perishable nature of fruit and vegetables and the limitations of horse transport meant that from initial settlement until the early 1900’s, most fruit, vegetable and wine production occurred close to major population centres. During this era, the most important areas of production were along rivers and creeks on the Adelaide Plains east, west and south of the city, and in the higher rainfall Adelaide Hills. Other pockets of production served local communities. These were developed in higher rainfall districts or close to rivers in the Barossa and Clare Valleys, and as far north as Wilmington. Irrigation of fruit crops along the River Murray began in 1887 with establishment of the Renmark Irrigation Settlement. 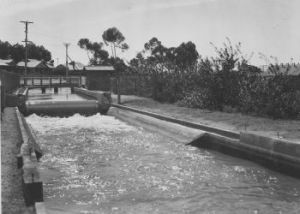 Significant expansion of River Murray irrigation occurred after WW1 with development of Soldier Settlement irrigation areas, building of the River Murray lock system, and connection to the rail system (Renmark linked January 1927). River Murray districts emerged as major citrus, dried fruit, canned fruit and wine production areas between the 1920’s and 1960’s as new irrigation settlements were established. Today, River Murray irrigation districts produce about half of the SA’s horticultural crops. Post WW2 saw further Soldier Settlement development, and dramatic changes in horticulture industries as road transport improved, refrigeration became more common, new pump technology enabled greater use of underground water supplies, improved tractors with hydraulic implement systems became popular, and forklifts enabled bulk handling and reduced labour input. Dramatic improvements in pest, disease and weed management have enabled horticulture industries to deliver much higher quality products to consumers. The advent of a wide range of chemicals after WW2 along with sophisticated application techniques such as air blast sprayers revolutionized pest and disease management. More recently, integrated pest management systems have greatly reduced reliance on chemical control agents. This technology contributed to 1960’s and 70’s expansion of horticulture on the Northern Adelaide Plains, South East, Eastern Mt Lofty Ranges and Mallee. During this same period, urbanization displaced horticulture from Adelaide’s Western and Eastern suburbs. Market and cost competitiveness has resulted in the rise and fall of many industries. Some of the industries to decline include celery, canning peach, dried fruit, frozen vegetables, and citrus for juice. The glasshouse tomato industry boomed in the 1950’s and 60’s, retracted with growth of outdoor tomato production in Queensland, but is experiencing a resurgence as it adopts controlled environment structures. SA’s fresh potato marketing businesses currently have a superior product and competitive advantage based on growing high quality product in Mallee sands. The olive industry is experiencing growth with increasing world demand for high quality oils. Mechanisation, new processing equipment and improved irrigation systems have enabled almonds to move from being a small scale industry in Adelaide’s suburbs to being a broadacre horticulture industry in Riverland districts. Government contribution to development of the wine and horticulture industries dates back to 1874 when the wine industry lobbied for the passing of the Vine Protection Act 1874. This was subsequently replaced with the Vine, Fruit and Vegetable Protection Act 1885, aimed at control and eradication of fruit flies, Phylloxera, Codling Moth, and other pests and diseases. Earliest development of Government experimental and demonstration farms for horticulture industries date back to 1885 with the planting of a vineyard at Roseworthy College. 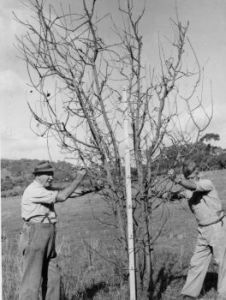 In 1908, a series of experimental orchards were established at Kybybolite, Hackney Road, Blackwood, and by the Lands Department at Berri. Other significant viticulture and horticulture experimental facilities were established at Nuriootpa (1939), Loxton (1962), Lenswood (1964) and Northfield (1968). This network of research facilities serving horticulture industries now consists of Loxton, Nuriootpa, Lenswood and Waite. It provides a wide range of research and development services to viticulture and horticulture industries across the various climatic zones. The Department of Agriculture had an extensive network of regional advisers (within its Horticulture Branch) servicing viticulture and horticulture industries. These adviser network emerged from the series of key Horticulture Instructors appointed in the early 1900’s, with district advisers providing a range of information and skilling services to small horticultural producers. The adviser network reached a peak in the early 1970’s when most major horticulture regions had an adviser servicing their district. From the 1950’s until 1976, Department of Agriculture horticultural advisers also handled horticulture inquiries from the general public and home gardeners. In 1976, a dedicated Home Gardens Advisory Unit was established to handle the large volumes of general inquiries. In 1982, this unit was transferred to Botanic Gardens. The Department of Agriculture Horticulture Branch has played an important role in management of new pest incursions over many years. The most significant of these has been Fruit Fly, with the first outbreak being recorded in SA in February 1947. Since this initial outbreak, systems for monitoring and eradicating fruit fly have been continually improved. This work has enabled key horticulture regions of the state to be declared to have fruit fly 'area freedom'. This in turn has enabled horticulture industries to access numerous export markets, the most significant being citrus to the USA. Marketing Acts have played an important role in development of key horticultural industries. 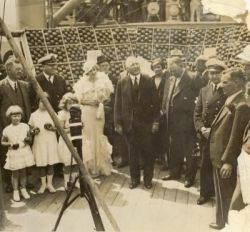 Marketing Acts and their associated Boards were introduced for more orderly marketing of citrus and dried fruits in the late 1920’s, and potatoes in 1948. Marketing Cooperatives have played an important role in linking growers together, and providing horticulture industries with cool storage, packing and marketing facilities. With the introduction of National Competition Policy, these Acts have been subsequently repealed or significantly amended. Legislation also played an important role in movement of produce marketing from the East End Market to a new industry owned facility at Pooraka in October 1988. Today, many horticulture industries have their own national levy collection mechanisms. These levies enable them to fund their own customized research and development programs, and actively establish specific industry strategic directions.